A classic story of clone meets clone. April Fools' Day is over for another year, thank goodness, but its spectre still looms over us. Don't worry, it's a good spectre. Back in 2018, Endless Space 2 developer Amplitutde Studios teased a dating sim set in its sci-fi universe. Yesterday, it released Love Thyself—A Horatio Story for free. If you're not au fait with the Endless Universe's colourful characters, Horatio is both an individual and a species. He's the ultimate narcissist, using genetic engineering to create a whole civilisation of Horatios. Think the classic Red Dwarf episode Rimmerworld. And now one of them is looking for love. As a Horatio cadet, you'll have to navigate the complexities of a clone society, try to become the most perfect Horatio in the galaxy, or rebel and chart your own course. And you'll need to seduce some other Horatios—four identical potential paramours for you to choose from, you lucky clone. You might be wondering where this lies in the Endless canon, and luckily Amplitude has an answer for you. "The Endless Universe’s 'true story' gets rebooted every time you start a new game. Love Thyself: A Horatio Story positions itself firmly on our in-universe sliding scale of canon as a 'dude, probably'". Despite its origins being a joke, Love Thyself doesn't seem like a parody. There are some gags and silly dialogue options, but most of what I've played has been more concerned with fleshing out Horatio society. See, the Horatio in question is defective, absent the imprinted memories of the rest of the clones, so they have to wing it, learning about how to act so they don't get discovered and recycled. 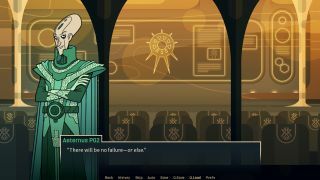 It's a very simple visual novel, but like most of Amplitude's factions, the Horatio are intriguing enough to carry the story. It's also accompanied by some cracking retro sci-fi backdrops, as well as character art that manages to make all of these clones look distinct. You can grab Love Thyself—A Horatio Story for free on Steam.